Saxophonist, Composer and Educator, born on May 24, 1937 in Fort Lauderdale, FL, Archie Shepp is a jazz saxophonist best known for his Afrocentric music of the late 1960s, a unique style of free-form avant-garde jazz blended with African rhythms, and his collaborations with John Coltrane, Horace Parlan, Cecil Taylor, and the New York Contemporary Five ensemble. His long career as an educator has focused on ethnomusicology, looking at the history of African-American music from its origins in Africa to its current state. 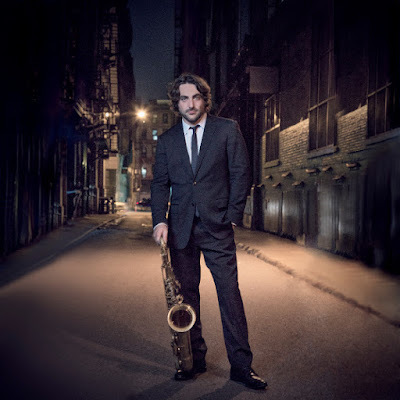 Shepp was born in Florida but grew up in Philadelphia, Pennsylvania, studying piano, clarinet, and alto saxophone before switching to the tenor. 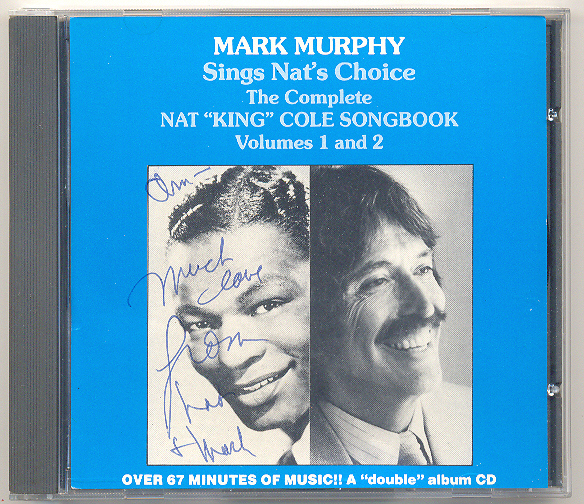 He studied drama at Goddard College from 1955-59, but chose music as his main profession. Shepp's first recording under his own name Archie Shepp - Bill Dixon Quartet was released in 1962. Four for Trane, an album featuring four John Coltrane compositions (and one of his own) followed in 1964, taking Coltrane's compositions into a more avant-garde direction that Coltrane himself would follow. Shepp’s bands in the mid-1960s featured musicians including Roswell Rudd, Bobby Hutcherson, Beaver Harris, and Grachan Moncur III. In 1965, Shepp was a sideman on John Coltrane's Ascension recording and was featured--along with John Coltrane--on New Thing at Newport, a live album with two sets from the 1965 Newport Jazz Festival. 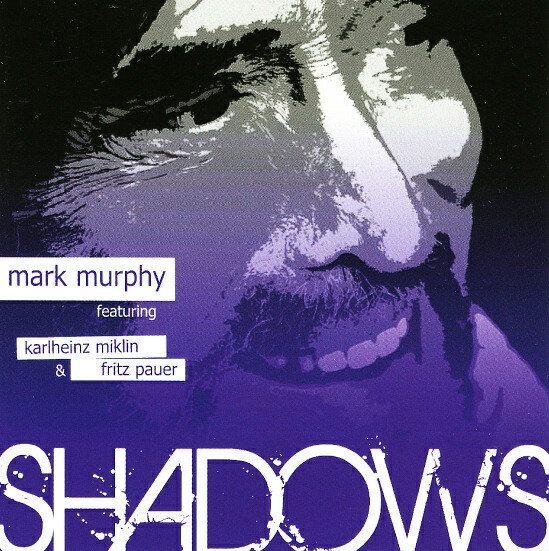 At this time, Shepp began looking to African cultural and music traditions for inspiration, as shown on such recordings as The Magic of Ju-Ju (1967), a recording featuring an African percussion ensemble. Before the end of the decade, he added teaching to his activities, first at the University at Buffalo, New York, and in 1971 at the University of Massachusetts, where he spent the next 30 years as a professor in the Afro-American Studies department. 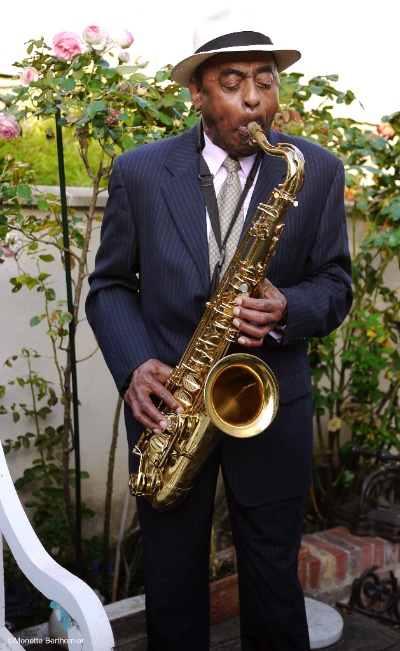 Shepp's musical explorations included spoken word and poetry components to his albums; occasionally stepping forth as a vocalist; and ballads, blues, rhythm and blues, spirituals, and tributes to other jazz musicians such as Charlie Parker and Sidney Bechet. His 1972 albums show distinct political messages: Attica Blues was a response to the Attica Prison riots, while The Cry of My People addressed civil rights. Shepp began touring extensively in Europe and started a continuing tradition of recording with European musicians, while at the same time continuing his musical interest in African music, such as his concert with the Moroccan group Dar Gnawa in Paris in 2003. 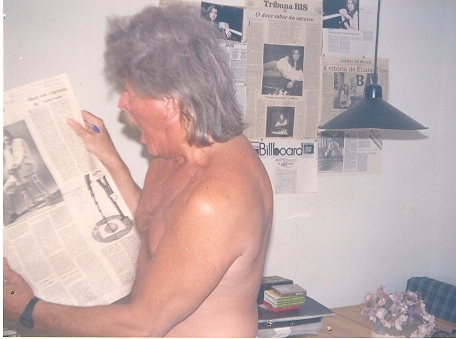 In 2004, Shepp co-founded the French record label ArchieBall to release his albums. The 2013 release by the label, I Hear the Sound by the Archie Shepp Attica Blues Orchestra, was nominated for a Grammy Award. 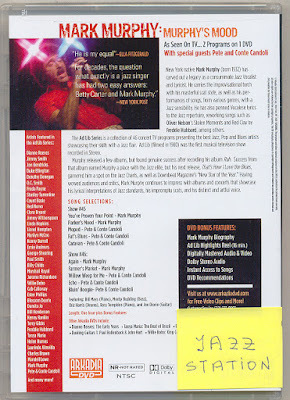 The artist is featured in the 1981 documentary film Imagine the Sound, produced by Ron Mann, and in Archie Shepp: je suis jazz c'est ma vie, a 2007 documentary by Frank Cassenti. The NEA Jazz Masters award is the highest honor that our nation bestows on a jazz musician and includes a cash award of $25,000 and an award ceremony and celebratory concert, among other activities. As part of the National Endowment for the Arts' 50th anniversary events, the annual NEA Jazz Masters celebration will take place in on April 4, 2016 in the nation's capital in collaboration with the John F. Kennedy Center for the Performing Arts. The National Endowment for the Arts will honor four jazz leaders with the 2016 NEA Jazz Masters award for their significant accomplishments in the field. This year's honorees range from fiery saxophonists who cut their teeth with the legendary John Coltrane, to a vibraphonist who reshaped the direction of jazz by introducing rock elements, to one who has dedicated her life to assisting jazz musicians in need. NEA Jazz Master awards are bestowed on living individuals on the basis of nominations from the public including the jazz community. The NEA encourages nominations of a broad range of men and women who have been significant to the field of jazz, through vocals, instrumental performance, creative leadership, and education. A free concert honoring the 2016 NEA Jazz Masters will be presented at 8:00pm on Monday, April 4, 2016, at the Kennedy Center's Concert Hall and also available in a live video stream at arts.gov, Kennedy-Center.org, and NPR.org/Music. In addition, as a way of expanding opportunities for the public to engage with the artists and their music, the celebration will include other activities April 2-5, such as moderated panel discussions and listening parties at NPR headquarters in Washington, DC, and educational opportunities for local DC students, which will feature some of the 2016 NEA Jazz Masters. More details on these events, including how to obtain tickets for the April 4 concert, will be announced in early 2016. Just got the sad news that singer and composer Gladys Havana Carbo Flower passed away yesterday, October 25, 2015, at 6:35pm in the Berkshires, Massachusetts, after a long battle against cancer. I loved her. I love her. 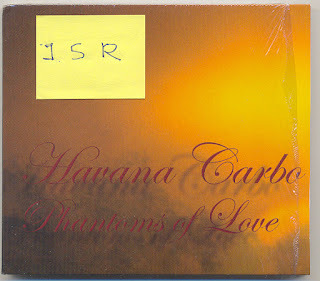 Carbo released few albums, but all are sublime. 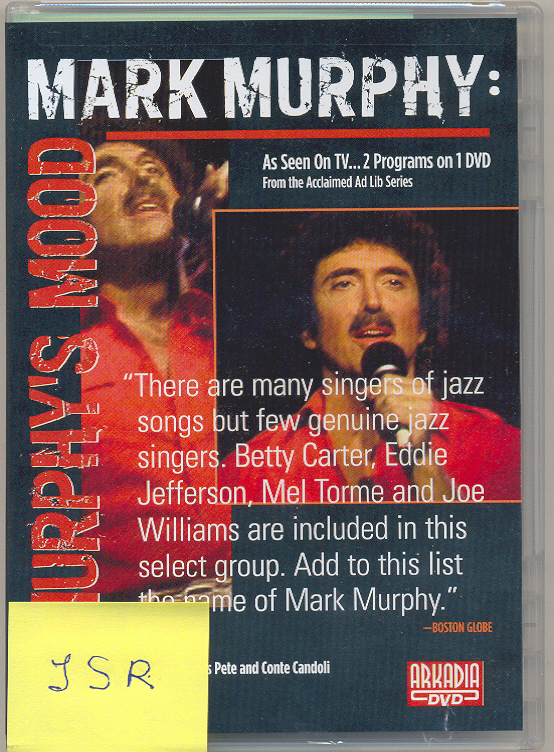 A supreme balladeer, one of the best singers I've ever heard, in the same level of Shirley Horn and Helen Merrill, she was considered by me as "the best female jazz vocalist of the year" in 2004, 2007 and 2010 in the Jazz Station Annual Poll. Born Gladys Lourdes Margarita Carbo Ramiro Garcia y de la Torre in Havana, Cuba, she lived in NY for decades, but relocated some years ago to Massachusets. We talked by phone for the last time ten days ago, when she was already very weak, but our conversation was long enough to remember many great moments of her career. She told me that the doctors had given her only 1 month more, and that she had decided to stay at home instead of going to an hospital. We both were deeply moved by this difficult (to use a light word) "situation." 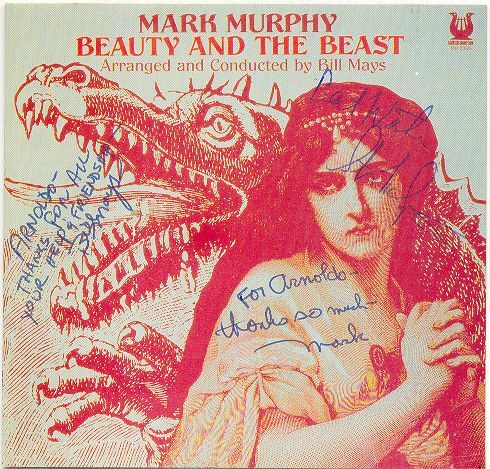 I'm losing so many friends this year - Mark Murphy a few days ago, Phil Woods, Lew Soloff besides many other great musicians that also passed away recently... Like I wrote to her in my last email message: "Te amo profundamente." Gladys Carbo Flower, 80, Cuban-American singer/composer HAVANA CARBO, née Gladys Margarita Lourdes Carbó Ramiro García y de la Torre, died peacefully on October 25, 2015 at Berkshire Medical Center in the loving presence of her family. Born in Havana, Cuba on February 22, 1935, she was the daughter of Nicolás Carbó and Herminia Ramiro. She attended Grover Cleveland High School in Queens, NY and Villanova University in Havana, Cuba where she studied Philosophy and Languages. She later studied musical theater at New York University. She moved to Stockbridge, MA in 1964 where she became active in the civil rights and anti-war movements. Gladys was also a pioneer in the women’s rights movement with a close cohort of early Berkshire County feminists and hosted many meetings in her home on Church Street. In the early 70’s, she managed the bar at the renowned Music Inn at Stockbridge, selecting and promoting a myriad of popular and jazz artists that we know and love today. She became a self-made business woman and in the 1970’s purchased the front of the 1884 building on Main Street, Stockbridge where she opened “Woffin’s Corner,” her very own, singularly unique and first-of-its-kind in the Berkshire’s, European toy shop. She later transformed Woffin’s Corner into “Habanera Boutique” — a lavish, elegant and utterly decadent fine women’s clothing store with globally imported fashions. Her series of business successes ultimately allowed her to return to her first love and finally pursue the musical dreams she had deferred for decades. She returned to Stockbridge in 2013 after living, performing and recording in Manhattan for 20 years. Growing up in Havana, Cuba in the 30’s and 40’s, Gladys was raised in its notably rich, rhythmically complex musical traditions. She displayed a natural gift for music and a facility for the piano by age three. By the age of eight, she began formal music lessons, relying mostly on her ear, and memorizing her lessons. Raised in an environment that celebrated music but viewed “nightclub” performing as inappropriate for a young lady, a budding career that began during her New York high school years was cut short. As a teenager, in high school, she created and led a vocal quintet, “The Holidates,” and held her first professional job as vocalist with Bobby Friedlander’s Band. Her introduction to American popular song and jazz came via Chet Baker, Dinah Washington, Sarah Vaughn, Ella Fitzgerald, Johnny Hartman, Frank Sinatra, June Christy, Mel Tormé, and later Shirley Horn, Maysa, Elis, Regina, João Gilberto, Edu Lobo, Ivan Lins and Antonio Carlos “Tom” Jobim. Fascinated and inspired by the directness of Brazilian lyrics, incomparable melodies and harmonies, she taught herself Portuguese to better understand the culture, and to do justice to her forthcoming compositions. 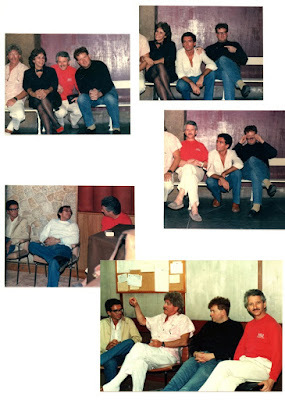 As luck would have it, while searching for lyrics to a song she heard sung by Gilberto called, “Retrato em Branco e Preto,” she was put in contact with its composer, the legendary Jobim, who gave generously of his time, by clarifying, translating, and answering her questions. With a style that defies category, sometimes described as “Chamber Bolero/Jazz," she wove her tapestry of meticulously chosen and rarely heard gems traveling seamlessly between Spanish, English, French, Italian and Portuguese, enchanting audiences and critics alike, ushering the listener into her world. Her many musical compositions were greatly influenced by Ralphe Vaughan Williams and Michel Legrand. The former Soul Note recording artist ("Street Cries," 1991), later signed with Mike Longo's CAP label ("So I’ll Dream You Again", 1997, and "Luna de Varadero," 2005) released "Through a Window, Like a Dream," 2007 and "Phantoms of Love," 2010, on MODLmusic, her own label. "Through a Window, Like a Dream" received the same enthusiastic response given her previous recordings, which garnered glowing reviews from as far as Braga, Portugal to Rio de Janeiro, Brazil, where the LA-based Brazilian producer/jazz writer Arnaldo Desouteiro wrote that Carbo possesses a “…singularly warm timbre…extraordinary phrasing and stirring expressiveness… and “is destined to develop a cult-following”, calling Luna de Varadero “SUBLIME…a perfect CD”. As a result she was selected by Mr. DeSouteiro as “Best Female Jazz Vocalist of 2004, 2007 and 2010" in the Jazz Station blog, according to the results of the Annual Jazz Station Poll, also published in Rio de Janeiro's daily newspaper Tribuna da Imprensa. Her “Stockbridge Requiem,” composed for two sopranos, full chorus, organ and Latin jazz quartet was performed at Saint Peter’s Church in New York, and the Marian Chapel in Stockbridge. She was a BMI member since 1985 and a Local 802 member since 1993. She was nourished by a love of music, family and friends. Gladys was also an amazingly gifted painter, sculptor and artist, leaving an additional published legacy of unique pen & ink drawings depicting various Stockbridge landmarks. She cherished her gift of music and art, fully aware of the responsibility and humility that came with that gift, while striving to keep her dream unconditionally uncompromised. Gladys is survived by four artistic, successful and loving children and partners, Michael Lavin Flower and fiancé, Alison Collins of Lenox, Robert Lavin Flower and wife, Laurie of Stockbridge, Aline Flower and partner Mary Yu of Bainbridge Island and Seattle, WA and Ethan Alan Flower and wife, Rebecca East of Los Angeles, CA. She also leaves her adoring brother, Nicolás Andrés Carbó, her niece Juliet Carbo DiTroia and husband John, as well as four grandchildren, Andrew, Wilson, Victoria Flower and Sarah Flower McCraw. SERVICES: A private family service is planned for Saturday, October 31. A public celebration of her life and music will be held in the near future. Per her wishes, donations can be made to Saint Peter’s Jazz Vespers. I suppose I should explain how my mind worked for this album. I don't do ‘up-tunes’ any more…for the sake of doing up-tunes to balance the album. ‘Happy’ music for no particular reason doesn't appeal to me...unless the song meets my criteria which includes beauty, construction and content. This particular collection is more than a bunch of pretty songs... they tell a story, are woven from a fine, sometimes fragile thread and speak of vulnerability, loss, haunting memories of love, and all are personal intimate moments. They are part of a complex process which starts with my interminable and ever growing list of songs I absolutely love. After months of editing out titles I found myself with a group of songs united by some common thread, often not immediately apparent. I followed my gut however, and began to recognize which ones worked and why. As I narrowed them down to the final dozen or so, I then began searching for a hidden reason or message that linked them all together, often concurrent with, and influenced by the state of my heart and my mind at the moment, or by the pain or joy of my soul. I let the music speak to me. Sounds nutty? Perhaps, but to me it's the only thing that makes sense. Commercial success is never a priority though the economic aspect surfaces like Hamlet's ghost as I confront the reality of my life, yet it never alters my vision or my artistic integrity. If anything it reinforces what I believe to be right. I’m fortunate and thrilled to work with such remarkable multi-talented musicians in an ambience of fun and friendship. I have the deepest appreciation for Dario Eskenazi’s legendary artistry, sensibility and highly developed sense of beauty, his myriad arrangements and the production of many songs (see credits) selfless dedication and an uncanny ability to make me laugh; for Oriente Lopez’s musicality, originality, versatility and music-direction of his arrangements; Vince Cherico’s rare sensibility, dependability, wisdom and long, helpful conversations, Leo’s sensual heartbeat bass, Sean’s solid dependable round tone, and the entire ‘Band of Angels’ for their brilliance, high level of professionalism and flexibility. I’m indebted to my sons Michael and Robert for long hours, patience and exceptional photography/ artwork; I am blown away by the generosity of spirit and kind words of extraordinary composer Gabriel Yared (Possesso). We are born, we die and everything in-between is a gift. Nourished then by music, laughter, love and beauty, I’m living that rare and beautiful gift. Glowing reviews come from as far as Braga (Portugal) to Rio de Janeiro, Brazil, where Arnaldo Desouteiro, La Tribuna wrote “ … her voice travels with a voice of singularly warm timbre and her phrasing has extraordinary and stirring expressiveness… …destined to develop a cult”. Her penultimate CD “So I’ll Dream You Again” was one of the top 10 in Jazz for 1997 in Brazil and in 2004 she was selected #1 Female Jazz vocalist of the year with her “Luna de Vardero” release. Artigo escrito por Arnaldo DeSouteiro em 01 de Dezembro de 2005 e publicado originalmente no jornal "Tribuna da Imprensa"
Em meio a tantos pastiches e armações de Jamies e Madeleines, devem ser recebidos com missa de ação de graças os novos trabalhos de Havana Carbo e Lou Lanza. De gerações distintas, abençoados com vozes privilegiadas, têm em comum não apenas a qualidade interpretativa e a originalidade de seus estilos, mas também um apurado e incorruptível senso estético que privilegia a beleza no seu sentido mais literal, em um tempo pautado pela inversão de valores. Transcendendo rótulos e estilos, mostram salutar ousadia criativa, ungindo-nos com um bálsamo sonoro multi-dimensional. 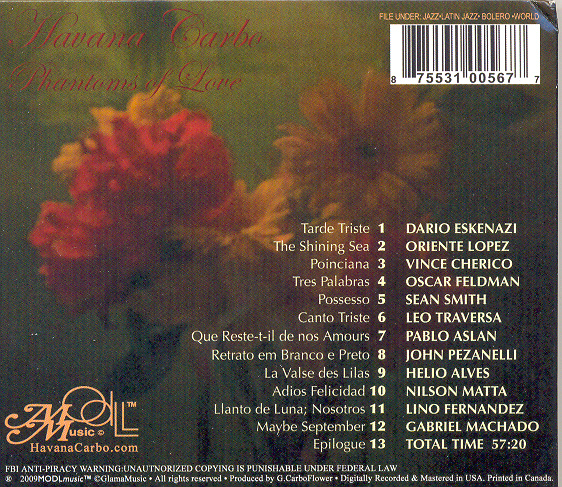 Desde “Street cries”, gravado em 1990 para o selo italiano Soul Note, Havana Carbo conquistou um cult-following que sabe estar diante de uma artista singular, dona de timbre incomparável, personalíssimo. 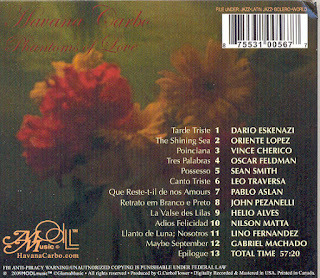 O charme, a sutileza e a sofisticação que fizeram de “So I’ll dream you again” (1997) um dos meus “desert island discs”, aparecem novamente neste segundo CD para o selo CAP, “Luna de varadero” (43m42s). A diferença está na instrumentação: enquanto, no álbum anterior, flautas, sax, trompete, guitarra e a percussão do brasileiro Valtinho complementavam o grupo de base, o novo disco alicerça-se somente no excelente trio formado por Dario Eskenazi (pianista argentino, da nobre linhagem de Bill Evans), Nilson Matta (baixista brasileiro radicado em NY há quase vinte anos, com quem tive a honra de trabalhar no CD “The Bonfá Magic”, de Luiz Bonfá, em 1991) e o baterista Vince Cherico (do grupo de Ray Barretto). Não se trata de um trio acompanhando uma cantora, mas de um quarteto com destaque para uma voz “lovely, warm and intimate”, na síntese perfeita de Ira Gitler, o maior historiador de jazz na atualidade. A cubana Havana, que cresceu e ainda hoje reside em NY, respira junto com os demais músicos. Sensação reforçada pela mixagem, que coloca todos no mesmo plano, optando por um som amplo, quente, “antigo” (no bom sentido), sem compressão, privilegiando a transparência de todas as freqüências e deixando a bateria soar realmente “acústica”. Os arranjos, em sua maioria assinados por Eskenazi (ouvido com Mongo Santamaría, Paquito D’Rivera e o Caribbean Jazz Project), são bem estruturados e funcionais. Para quem não dispensa comparações, Havana poderia ser colocada em patamar similar ao de Helen Merrill (mas com maior carga de sensualidade) e Shirley Horn (sem sofreguidão). 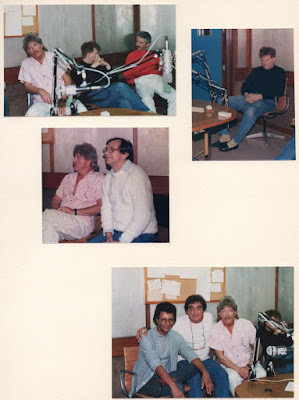 Ao longo das 13 faixas deste álbum sublime, Gladys Havana Carbo faz do ouvinte seu cúmplice, acariciando sua alma, convidando-o para aconchegar-se através do antológico “Acércate más”, de Oswaldo Farrés. Popularizado nos EUA por Nat King Cole, raramente recriado por jazzistas (Zoot Sims nos presenteou com uma bela interpretação sob o título de “Come closer to me”), reaparece aqui em luxuosa levada de bossa-bolero. A carga de sensualidade aumenta ainda mais em “No me platiques más”, do mexicano Vicente Garrido. 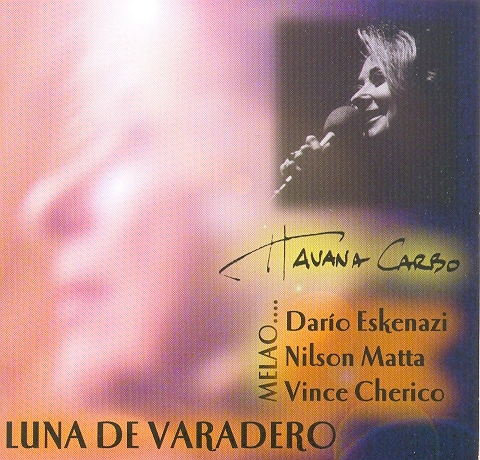 Mrs. Carbo segue deslizando por “Moon and sand”, de Alec Wilder, que ganhou novos fãs após a gravação de Chet Baker na trilha de “Let’s get lost”. Por falar em Chet, outro tema emocionante, “The wind”, escrito por seu pianista Russ Freeman e regravado por, pasmem!, Mariah Carey, ganha nova dimensão na voz de Havana. O batera Vince Cherico contribui para o efeito hipnótico, usando “mallets” até o início do solo de Eskenazi. No standard “I fall in love too easily” (tema da dupla Jule Styne-Sammy Cahn para o filme da MGM “Anchors Aweigh”), Havana dá conta do recado em 2m49s, com espaço ainda para um solo de Nilson Matta. Na faixa-título, “Luna de varadero”, de Bobby Collazo, Vince troca a bateria pelo bongô. O clima torna-se ainda mais intimista nos duos de voz & piano em “Aquellas pequeñas cosas”, do espanhol Joan Manuel Serrat, e “Atrás da porta”, de Francis Hime & Chico Buarque. 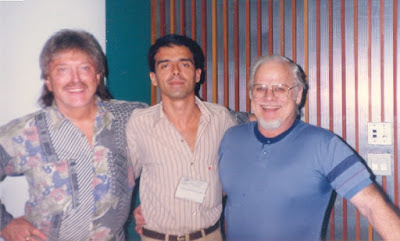 Outra música brasileira no repertório, também com arranjo de Nilson, “Bonita” é cantada como uma “bossa up-tempo” com a letra em inglês de Ray Gilbert para a jóia lançada por Jobim em seu “The Wonderful World”, com arranjo de Nelson Riddle em 65. O pianista Eskenazi realiza um de seus melhores solos, aliando o lirismo de Bill Evans ao balanço econômico de Tom, citando “O barquinho” durante a tag, enquanto Vince usa as vassouras com a costumeira categoria. Carbo, cuja intimidade com a bossa nova vem desde o tempo em que atuava com o batera Edison Machado, retorna às baladas emendando “I wish I knew” (com delicadeza comparável ao tratamento de Keith Jarrett) à “In the wee small hours of the morning” (imortalizada por Sinatra), antes de mostrar sua face autoral na valsa “Paris”, aberta pelo assobio de Eskenazi, e de letra nostálgica, inspirada em um verão de passeios por Montmartre. No boleraço cubano “Contigo en la distancia”, de Cesar Portillo de la Luz (o mesmo de “Tu, mi delirio” gravado por Astrud e pelo Azymuth), sucesso de Lucho Gatica, Olga Gullot e, agora, Christina Aguilera, Carbo chega ao ponto máximo de emoção à flor da pele. Tema de encerramento, “No dejes que te olvide” (Ignacio Villa), remete às noitadas de seu principal intérprete, o lendário Bola de Nieve, no clube Tropicana, de Havana, cantando as dores de amor sem desespero nem melodrama. Fecho ideal para um disco perfeito, apaixonado e apaixonante. Simply put: The best male singer in the history of jazz. The end. I'm completely devastated. I became a huge fan since the first note I heard him singing. 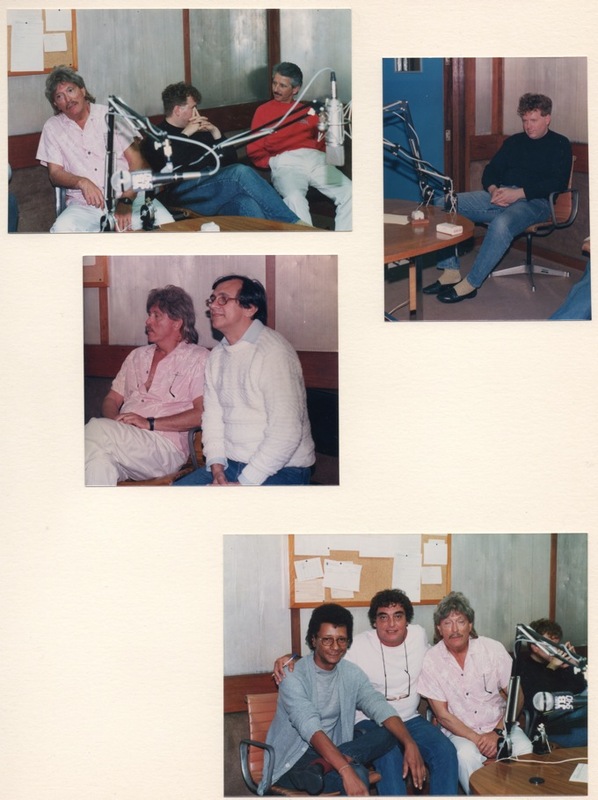 We were friends for over four decades, he used to stay in my home when he had gigs in my native Brazil, and I used to visit him everytime I traveled to San Francisco, when he still lived there during the 80s and 90s. We also met a lot in IAJE conventions; I was always in his tremendous masterclasses and he honored me with his presence in my lectures and clinics. I collect all his releases, besides a great number of previously unreleased tapes and videos. Not to mention some movies of his appearances as an excellent actor (he even played the role of Jesus Christ!) Luv u forever! 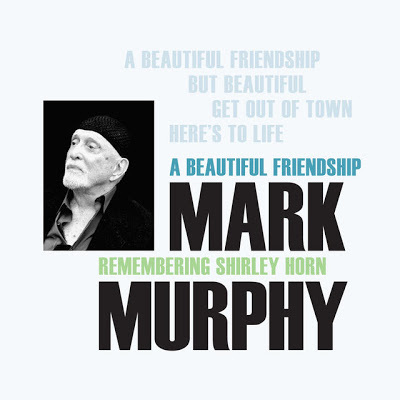 Sheila Jordan's post on Facebook: "I just learned from friends that My Buddy of over 50 years has passed away. I am devastated. I knew it was coming but I had hoped I would be in the states and not in Europe on tour when it happened. I will dedicate my concert tonite to you my dear Mark. I am grateful that I was able to visit Mark during his illness and especially just a week ago. I have so many funny stories about our friendship and tours together. You will always live in my heart my friend. Rest in Peace, Markie.."
Sonny Rollins will be presented with the Jazz Foundation of America's Lifetime Achievement Award on Thursday, October 22, at the Apollo Theater during the foundation's 14th Annual "A Great Night in Harlem" gala concert. The concert segment honoring Rollins will feature performances by Donald Fagen (of Steely Dan), Jimmy Heath, Jack DeJohnette, Gary Bartz, Billy Harper, Randy Brecker, Clifton Anderson, Kenny Garrett, Ravi Coltrane, Al Foster, James Carter, Wallace Roney, the Cecil Bridgewater Big Band, and more. "What a privilege it is to have Sonny Rollins grace the stage," says Wendy Oxenhorn, Jazz Foundation of America's Executive Director. "[Musical director] Steve Jordan has gone above and beyond to make this a fitting tribute worthy of Sonny's genius in return for all the decades of the music he has given to the world. For us and the Great Legends who are coming out for Sonny, this is our humble attempt to say 'thank you.'" For 26 years, the Jazz Foundation of America has been keeping jazz and blues alive by helping musicians who played with everyone from Duke Ellington and Billie Holiday to Jimi Hendrix and the Rolling Stones. The organization now assists in more than 5000 cases a year nationwide -- preventing homelessness and eviction by paying rents and mortgages; providing free medical care and operations; maintaining a Musicians' Emergency Fund to address a wide range of crises. "What a necessary, wonderful organization!" says Rollins. "I've been aware of the Jazz Foundation's work for many years now, including the assistance they've given to so many of my colleagues. I'm honored to receive this award from them and to lend them whatever support I can now and in the future." Rollins is presently completing work on a new album in his Road Shows series of live performances for release by his label, Doxy Records. Holding the Stage: Road Shows, vol. 4will be released on April 8, 2016 under a distribution agreement with Sony Music Masterworks and its jazz imprint OKeh Records. For further information about the Jazz Foundation and the Great Night in Harlem gala, please visitjazzfoundation.org. 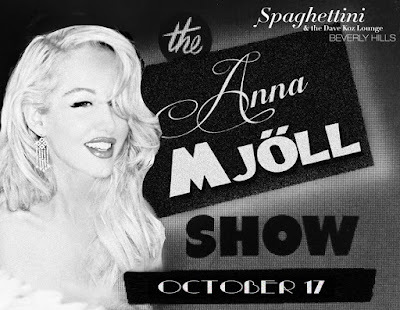 Timely reservations are STRONGLY recommended as Ms Mjöll's past performances at Spaghettini Beverly Hills have SOLD OUT fast. "In recording news, I'm thrilled that my Bach For Guitar/Lute Suites" is now available on Warner Classics," Isbin sats. I created these guitar performance editions in collaboration with the legendary Rosalyn Tureck." 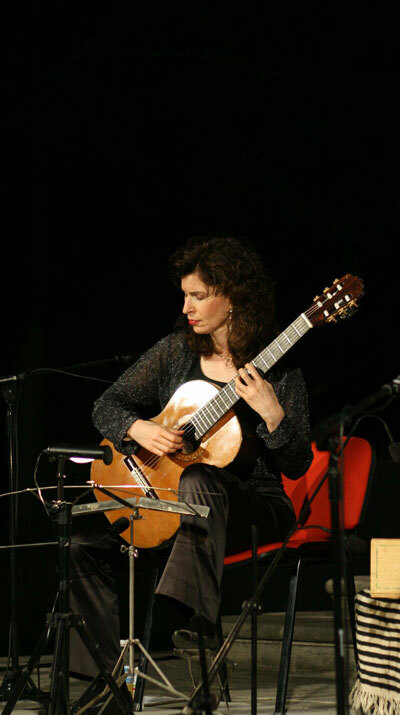 Other recent highlights in the career of this virtuoso guitarist include a fun one-hour feature on NPR's Song Travels hosted by Michael Feinstein and the world premiere of Chris Brubeck's beautiful "Affinity: Concerto For Guitar & Orchestra" written for Sharon Isbin and which she performed with the Maryland Symphony conducted by Elizabeth Schulze. The premiere was featured on Performance Today for 300 public radio stations and 1.4 million listeners. 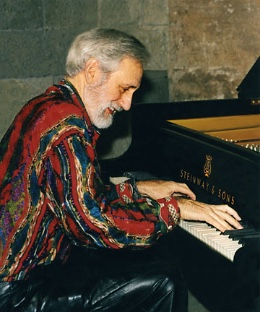 Jazz piano master Denny Zeitlin will appear in the solo concert "Exploring Thelonious Monk," on December 4, at 8pm. Venue: Piedmont Piano Company, located at 1728 San Pablo Avenue (at 18th Street) in Oakland, California. Zeitlin's latest CD, "Riding The Moment" (Sunnyside), is a duo of electro-acoustic improvisations with drummer George Marsh. 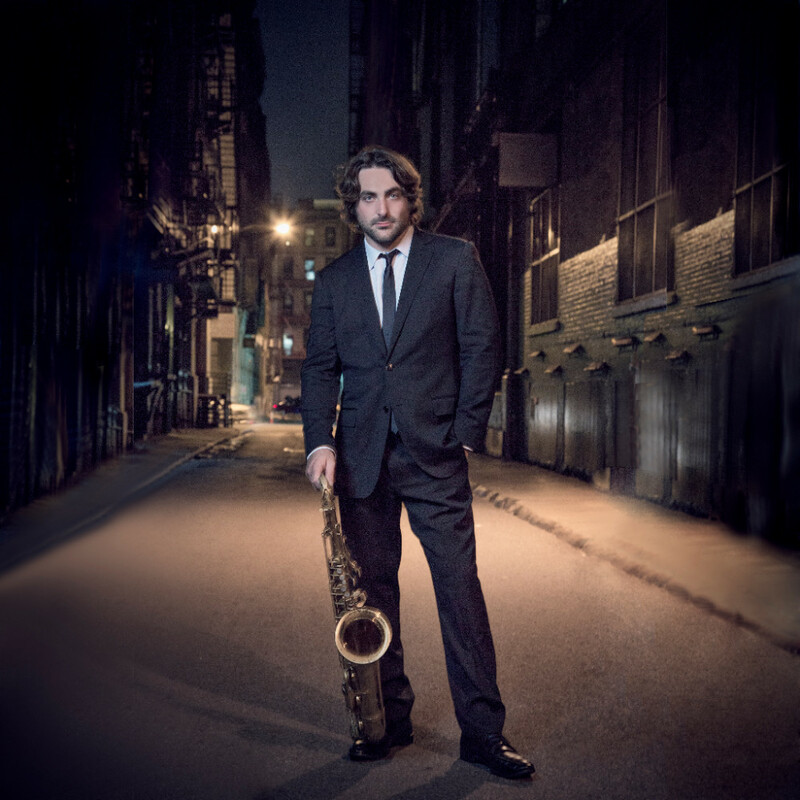 Tenor saxophonist Noah Preminger releases his fourth album, "Pivot: Live at the 55 Bar," tomorrow, October 6th. 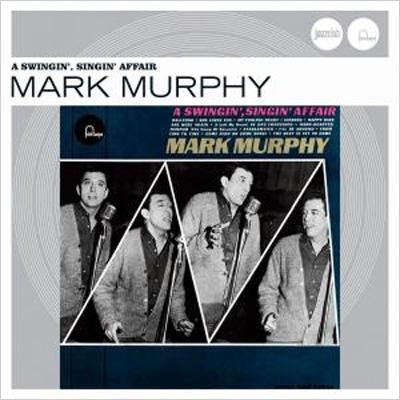 "Pivot: Live at the 55 Bar," recorded in the heat of the moment at the Greenwich Village nightspot by Jimmy Katz, finds Preminger exploring both his obsession with age-old Delta blues and his desire for a more fluid, intense way of playing jazz. Preminger and his new kindred-spirit quartet - with Jason Palmer (trumpet), Kim Cass (double-bass) and Ian Froman (drums) - were captured performing two thrilling half-hour rhapsodies based on songs by one of the saxophonist's favorite blues singers, Bukka White (1909-77). They re-imagine his soul-deep "Parchman Farm Blues" and "Fixin' to Die Blues" by way of Ornette Coleman's Free Jazz, Sonny Rollins' wide-open Our Man in Jazz and the John Coltrane Quartet's last, envelope-pushing flights, all the while transmuting past into present for a 21st-century vision of free-minded but hard-swinging jazz. The quartet celebrates the CD release at 55 Bar this Wednesday October 7th. Two sets starting at 10 p.m. Enjoy! 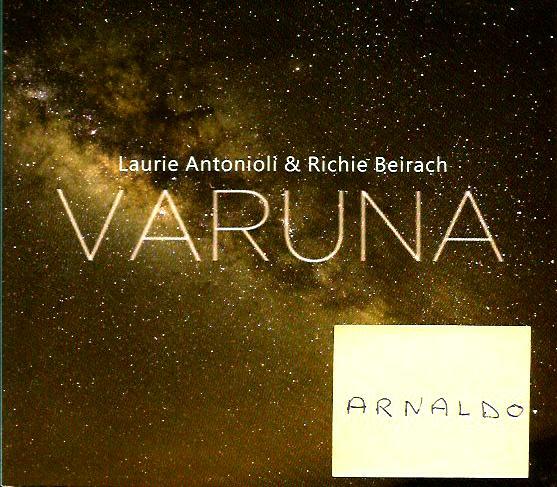 Vocal CD of the Month - "Laurie Antonioli & Richie Beirach: Varuna"
Since returning to her native Bay Area in 2006 from a period of living and working in Europe, vocalist Laurie Antonioli has concentrated her creative energies on her American Dreams band, which backed her on last year's breakthrough Origin Records release Songs of Shadow, Songs of Light. For her new Origin CD, Varuna, Antonioli returns to an important chapter in her musical life by recording intimate sessions with her collaborator of more than 25 years, the esteemed pianist Richie Beirach. The CD, Antonioli's 6th as a leader, was released September 18. "I've been sitting on these sessions until the time was right," says the vocalist of Varuna, which was recorded in Leipzig, Germany (Beirach's home base) nearly 10 years ago and completed in Berkeley in 2012. "We do some of Richie's brand-new original material, with my lyrics, as well as several standards completely reimagined. The Resolution Suite features three pieces improvised by Richie and me with bassist Pepe Berns. The poem on 'Revelation' happened in the moment, and 'Exaltation' was inspired by Coltrane's 'sheets of sound.'" "Laurie is the real deal," says Beirach, "with a rich, elegant alto voice, great intonation and phrasing, and most of all, that unteachable, unexplainable element of humanity in every note she sings. Piano and voice is very intimate, with no place to hide but incredibly free and capable of magic moments. I love working with Laurie because it's truly like breathing from the same source of air. Especially on this CD, we are as one mind, one will, and one musical entity." 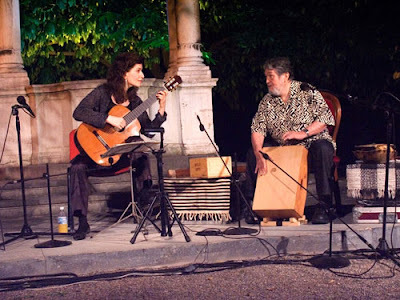 Antonioli and Beirach's first recorded encounter, in 1992, was a startlingly inventive date released by Nabel Records in 2005 as The Duo Session. With Antonioli holding down a professorship at Austria's KUG University between 2002 and 2006 and Beirach teaching in Leipzig, they performed regularly in top clubs and concert halls around Europe. The prolific Beirach gave Antonioli his latest original tunes so she could write lyrics to them, an activity that has formed the backbone of their creative partnership. "Writing lyrics to Richie's music feels like an extension of our conversations," says the vocalist. "And knowing what he had in mind often informs the storyline. "Varuna features three of these songs: the hauntingly cinematic "Inside My Dreams"; the sensuous ballad "My Love"; and the gently flowing title track, which establishes a shimmering feel that pervades the entire album. Varuna, the Vedic god who lives in celestial waters, is also the name of the recently discovered dwarf planet near Pluto. 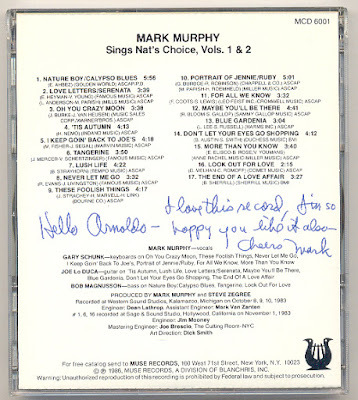 The album's themes of time and space are echoed throughout -- longing for home in "Over the Rainbow," the night wind in "Summer Night," the unseen presence of a loved one in "You're an Angel Now" (Laurie's lyrics to John Patitucci's music). 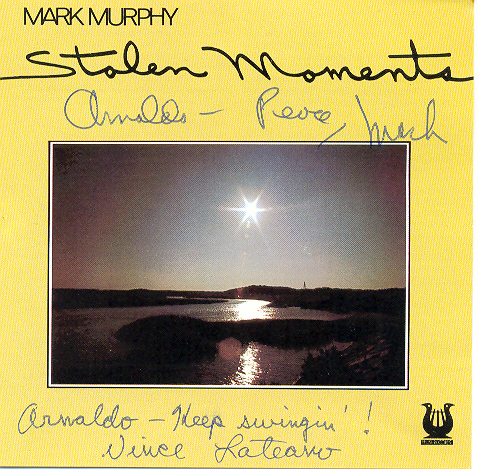 Early on in her career, Laurie Antonioli was a protégée of Joe Henderson, Mark Murphy, and Pony Poindexter, who recruited the 22-year-old singer for an extensive European tour that turned into an eight-month sojourn in 1980. Following the release of her 1985 recording debut Soul Eyes, a duo album with George Cables, Antonioli was one of the Bay Area's most visible singers, booked at leading venues and festivals with her own band, performing regularly with Bobby McFerrin, and sitting in with luminaries likeTete Montoliu, Jon Hendricks, and Cedar Walton at Keystone Korner. Laurie's second album, 2004's Foreign Affair, is a bracing blend of post-bop jazz and Balkan music created with players from Serbia, Albania, Germany, and the U.S. 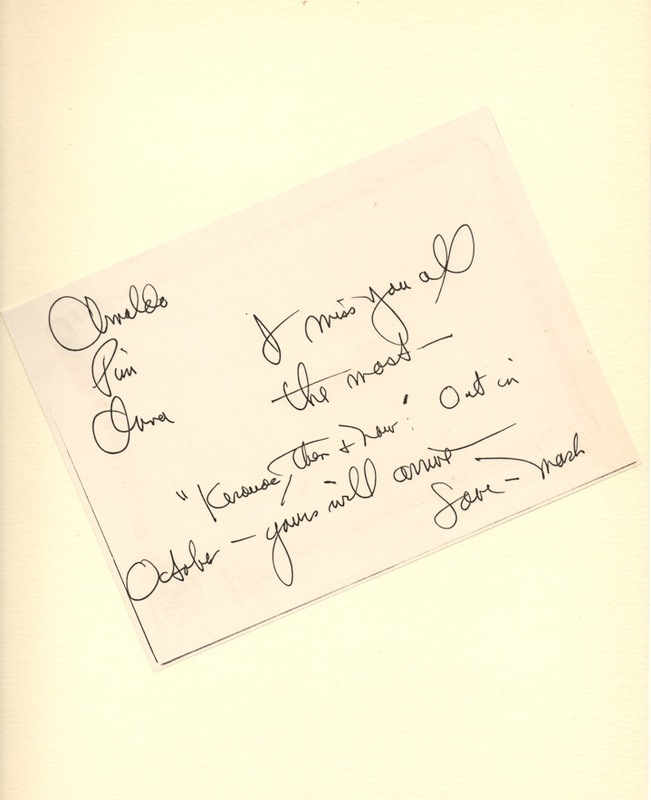 Her fourth, American Dreams (2010), was inspired by feelings that arose during her years abroad and features a number of her collaborations with Austrian pianist Fritz Pauer. 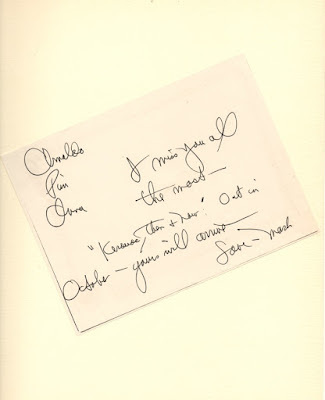 Her brilliant 2014 Joni Mitchell tribute, Songs of Shadow, Songs of Light, appeared on numerous best-album-of-the-year lists and received particularly cherished accolades from Ms. Mitchell herself, who invited Antonioli to perform at SFJAZZ's May 2015 gala celebration in Mitchell's honor (alongside Kris Kristofferson, Kurt Elling, and Patti Austin, among others). 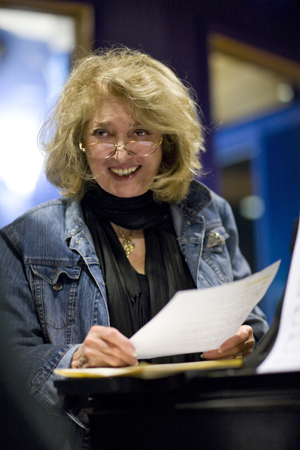 For the last nine years Antonioli has served as the Chair of the Vocal Program at Berkeley's California Jazz Conservatory (formerly the Jazzschool). She created a unique eight-semester curriculum for the Vocal Department's degree program as well as overseeing hundreds of artists in workshops and concerts she organizes. "I enjoy the opportunity to pass on what I've learned and implement a program that is both organic and academically sound. That said, artistry is elusive and not necessarily something that can be taught, which is a very provocative challenge. I'm motivated to contribute what I can to preserve this delicate, complex, and soulful art form." Laurie Antonioli and her American Dreams band will be appearing 10/10 at the California Jazz Conservatory in Berkeley; and 11/20 at the Unitarian Church in Berkeley, before entering Fantasy Studios 12/14 to record their next album. Antonioli and Beirach are planning a European tour, with dates to be announced, in April 2016.